From technology to business, two (or more) heads often prove to be better than one-but only if those heads are cognitively diverse. Top-performing companies, universities, and innovation centers are increasingly finding ways to encourage a greater exchange of ideas among their staff. Scientific journals continue to see the number of authors per paper rise, while both Nobel Prizes and patents are frequently granted to teams. The need for group problem solving has never been more critical. So what's driving the demand? The changing nature of work: The complexity of challenges faced by today's "creative class" has produced a new reliance on teams. A group with diverse experience and education can often more effectively provide solutions by bringing myriad viewpoints to the table. Demographic trends and technology: Technology is making the world smaller and connecting us with diverse sets of people and ideas. Our cultural identities influence everything from the books we read to the stories we hear in childhood and, thus, the way we make sense of the world. Diverse perspectives are a powerful tool for maximizing productivity and enhancing collective performance. Believe it or not, you can even be "diverse" all by yourself. You can, to quote Walt Whitman, "contain multitudes." The Hidden Factor: Why Thinking Differently Is Your Greatest Asset is your opportunity to learn the strategies that make you a more diverse thinker and position you to break down institutional silos and build robust, effective teams. Delivered by Professor Scott E. Page of the University of Michigan-a pioneering researcher in his field-these 24 thought-provoking lectures are packed with case studies, cautionary tales, and formal mathematical methods that prove the case for cognitive difference. identify conditions in which diversity trumps ability. By teaching you to "see around the bend" and analyze decisions from multiple perspectives, The Hidden Factor even has practical benefits beyond the workplace. From determining which house to buy to where to invest your money, life requires making smart predictions at every turn. At the outset of the course, Professor Page acknowledges the elephant in the room: that diversity is a politically charged term. Although there is a strong correlation between identity diversity (differences in cultural backgrounds) and cognitive diversity (differences in how people think), the professor makes it clear that the focus of this course is cognitive diversity and how we can leverage it to solve complex problems. As an individual: You'll benefit personally by being able to view problems from multiple perspectives and by building a diverse tool kit. As a team: Teams of cognitively diverse people can produce more ideas, find better solutions, encounter fewer mistakes, and make better forecasts than will individuals or homogeneous groups. As a society: Diverse societies are productive, innovative, and interesting, while societies that lack diversity risk collapse. Of particular use to those in management or hiring positions, The Hidden Factor demonstrates how variety in staffing engenders organizational strength. Typically, candidates are evaluated in a linear fashion on the basis of how a certain skill applies to a certain task. However, new hires bring along "toolboxes" filled with unique perspectives that current employees may not offer. 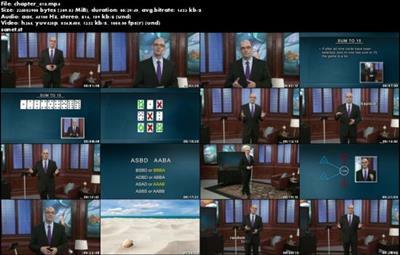 To illustrate this key tenet of the course, Professor Page uses a number of eye-opening examples and mental exercises. One such scenario highlights the tests that companies like Microsoft and Google administer to job applicants. Talent-based logic implies only those with the highest scores should be hired. Diversity-based logic says otherwise. Following talent logic, you should add candidates B and C to the team. But diversity logic suggests that you look at the distribution of questions answered correctly in addition to the scores. Applicants B and C each get 1 through 8 correct but cannot solve question 9 or 10. Applicant A misses 1 through 3, but correctly answers 4 through 10. Diversity-based logic tells you that the team will do better if it contains cognitively diverse people, so you should hire person A and either B or C.
Throughout the course, formal mathematical models nail down the logic behind the professor's conclusions. While the theorems and formulas are important for understanding the conditions necessary for a proposition, a love of numbers is not required to master the concepts. As Professor Page walks you through the math, you'll arrive at some astounding realizations-such as the fact that diversity and ability are of equal value in producing collective wisdom. Also, a diverse crowd will always be more accurate than its average member. You'll also see the central role forecasting plays in organizations and even in your daily life. Not only is it important for nuts and bolts operational issues, it enables more effective design of products and policies. In order to give people what they want, you must know what they want, and that involves forecasting. Analogies allow you to make estimates about an unknown entity by using the value of something comparable. The Fermi method/dimensional analysis breaks an estimate into parts, and then multiplies those parts together. Linear decomposition relies on dividing a whole intoparts and then finding the sum of those parts, assuming the value of the individual components is known. Trend analysis is based on what statisticians call a time series. This method uses a sequence of data-such as daily temperatures or stock prices-to forecast the future. While the models presented are not "all-knowing oracles," they do provide strong foundations from which to launch the decision-making process. In a rapidly changing world, it's imperative to stay agile by possessing a diverse set of tools. Institutional practices that may have worked well in previous years may cease to perform as the landscape changes. The Hidden Factor recounts numerous noteworthy examples of large-scale failure and collapse, a common cause of which is groupthink. From the U.S. housing market crash to the fall of entire civilizations, you'll take an in-depth look at reasons this phenomenon occurs and strategies to avoid it. As a leading expert on complexity and diversity, Professor Page offers his original research alongside that of other noted practitioners to put you on the cutting edge of this field. His engaging, often humorous teaching style leaves no doubt why he is a sought-after lecturer at top universities, businesses, and nonprofit organizations. All 24 lectures are filled with a colorful array of down-to-earth analogies and examples that illuminate the intriguing, perception-shifting concepts at the core of this ambitious course. Professor Page also provides concrete, factual logic undergirding this hidden factor of success. Charts, graphs, and other images clarify the data, while math equations make the lessons easy to follow. The Hidden Factor clearly demonstrates that the problems facing society will grow ever more complex as the low-hanging fruit all but disappears. Leveraging diversity isn't as simple as counting up the number of types and saying more is better; it requires the proper connections and interactions between those diverse parts. Stay competitive by training your mind to think differently with this invaluable course. 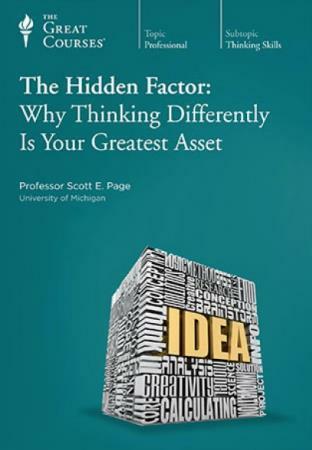 The Hidden Factor Why Thinking Differently Is Your Greatest Asset Fast Download via Rapidshare Upload Filehosting Megaupload, The Hidden Factor Why Thinking Differently Is Your Greatest Asset Torrents and Emule Download or anything related.